We had a wonderful Christmas. Katie arrived home for winter break on the Megabus (which arrived early, wonder of wonders! ), and Megan and Andy made the trek from Maryland. They stopped at the Englerts on the way over, which gave them a nice little overnight break. They got here around 4:30 Christmas Eve. I made a big supper since we were going to spend Christmas Day at my sister's house, and then we opened presents. Christmas Day as we were about to head out to Kathy's, my nephew called to tell me that I-44 was shut down. We thought it was due to ice on the roads, but later found out that a highway patrol officer had been killed when he stopped to help an accident victim. So sad - no Merry Christmas for that family. We ultimately made it out to Union and had a great time with my sister, her children and assorted in-laws. My brother-in-law was not due to leave Iraq until the 26th, so we had to celebrate the holiday without him. Megan and Andy stayed with us until late afternoon on the 27th before heading once again to her parents to spend the night before driving back to Maryland on the 28th. We very much enjoyed their visit, and got several rounds of cards and Yahtzee in. 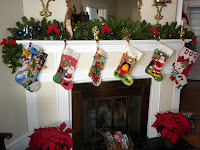 Oh, and I should mention that Megan loved the stocking I made for her, so that made me feel good. Last night Jim and I took Kathy up to the airport and we picked up Skip, her husband. He just spent 8 months outside of Baghdad helping the Iraqis get their computer servers up and running, and training them on how to maintain the system. He was supposed to be there a year, but the contract was changed once he had been there 6 or so months. Because he will have severe tax implications for returning before 12 months are up, he will only stay in the US for 2 weeks before heading down to Belize to stay with his sister for 4 months. What a goofy system we have! The Procession is Over - Finally! Yesterday I completed the Christmas stocking I was making for Megan. Entitled "The Procession" it consisted of 105 pieces to cut, embroider, sequin and bead, sew together and in many cases, to stuff. Wanting her to have a stocking similar to Andy's (and five others I have made for the family), I purchased a Bucilla kit. The last one I made was in 1991 for Katie. They have come a long way since then, with much more intricate designs and many more pieces. 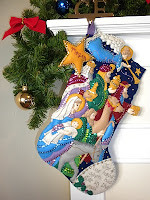 It must have taken me over 100 hours to complete this stocking. I had seen online that a lady will make stockings for you, charging $135. Now math is not my forte, but I paid $20 for the kit and put in a lot of hours of my time. So she gets what? $1.15 an hour for her time??? Yikes! At any rate, it is now done and it is slightly larger than Andy's, not to mention much more dynamic. It will be interesting to see what he says when he looks at her stocking hanging next to his on the mantle. Will he be requesting a new one for next year? Or will he be sentimental and want to keep the one I made him when he was born?